Mundas are the central Indian tribe and recognized as an immigrant tribe in Tripura. Original homeland of Mundas was at Chota Nagpur. Mundas are Proto-Australoid tribe. 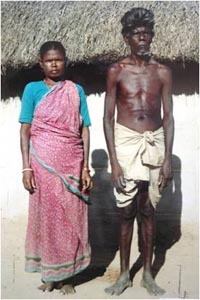 Mundari is their language, which is belongs to Austro-Asiatic family. In Tripura Mundas were brought to work in Tea garden and in Brickfields during the 1st part of 19th Century by the then King of Tripura. Their present population is 14,544 as per 2011 Census and mainly concentrated at Kailashahar, Manu Valley Tea Estate and other Tea Estates in the State. Mundas live in mixed villages with other tribes. They enjoy their life during working in Tea garden with community participation, group hunting with bow and arrows of wild animals and birds, group dancing and singing and also enjoying country liquor irrespective of age bar in any ceremony or festival. Mundas are Hindus. They also have faith in their traditional deities. In every Munda village there would be three important features (1) SARANA, (2) AKHRA and (3) SASAN. Besides PAHAN (Priest) have an important role in the life of Mundas. Pahan look after all religious rites and rituals, community festival, marriage, treatment by appeasing village deities and funeral rites. Mundas economy is so hazard that they still live on hand to month. They frequently depend on village Mahajan. Even then, lot of changes in their socio-economic life could be observed now a days.